Master the fundamental calculations principles and basic techniques you need to know for successful pharmacy practice! Thoroughly reviewed by practitioners, and educators, this 15th Edition maintains high standards for both academic and basic practice requirements, while offering the most comprehensive and in-depth coverage of pharmacy calculations available. A consistent, step-by-step approach makes it easy to work through the problems and gain a greater understanding of the underlying concepts. 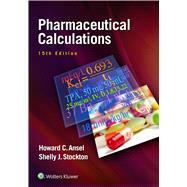 New co-author Shelly Stockton brings her experience in pharmacy practice and expertise in teaching pharmaceutics and pharmacy calculations to this edition. Hundreds of new problems, including many current products and select product labels directly linked to example problems. NEW Authors’ Extra Points provide brief explanations of underlying subjects such as pharmacopeias, electronic prescriptions, drug names, and the regulation of pharmacy compounding. NEW section on equianalgesic dosing for narcotic analgesics, including dosing tables. Student-friendly features like in-chapter example problems with step-by-step solutions; end-of-chapter practice problems with answers; Case-in-Point features with clinical or pharmaceutical case studies; Calculations Capsules with boxed summaries of chapter calculations; CalcQuiz sections with unsolved problems for review; and Comprehensive Review Problems for a final self-assessment.